As some people might know, but most probably don’t, my main PhD project centered around an emergence of pyrite-related damage in Ireland. More to the point, the project looked at the damage caused by the expansion of pyritic mudrocks used as fill below domestic floor slabs. 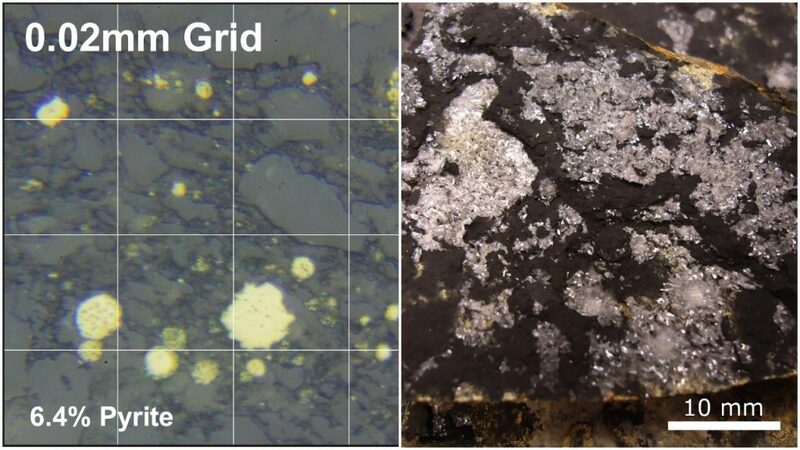 Pyrite (chemical formula FeS2) is formed in low-oxygen environments such as those found in deep sea conditions, where organic-rich, fine grained sediments such as mudstone form. Many minerals that form in such environments are not stable under normal atmospheric conditions and so, when these minerals are exposed to air and water, they change to a more stable form. In the case of pyrite, it oxidises. This exposure to air and water occurs naturally at the rock face in outcrops, although it is limited to the outer surface of the rock material. However, when the material is, for example, quarried and processed and compacted at optimum moisture content into the foundations of a domestic property, the outer surface of each individual fragment of rock is exposed to both air and moisture. Exposure to the air and water has minimal direct effect on the mudstone, what it does is begin the process of oxidising and breaking down the pyrite crystals. One of the products of the oxidation is sulphuric acid, which means that the moisture in the fill also becomes acidic. For many engineers, the problem stops there; or rather it starts there. Acidic groundwater is a key factor in sulphate attack on concrete, indeed, pyritic rock has itself been known to contribute to sulphate attack on concrete. Sulphate attack happens when ions from the acidic groundwater migrate from into the concrete causing reactions within the concrete matrix. This migration of ions causes expansion of the concrete as secondary minerals such as gypsum, ettringite and thaumasite start to form within the matrix. This causes cracking and breakdown of the surface of the concrete, as the expansion overcomes the concrete’s tensile strength, and reduces the overall strength of the concrete in those areas. In severe cases, it can reduce the strength of the matrix to such an extent that the material can be broken apart by hand. It will, if left long enough, result in the surface of the concrete, potentially to tens of millimetres depth, turning to what can be referred to as “mush”. This is an “accurate technical term”, more or less, and is wonderfully descriptive for what the material looks like after sulphate attack has been at work. 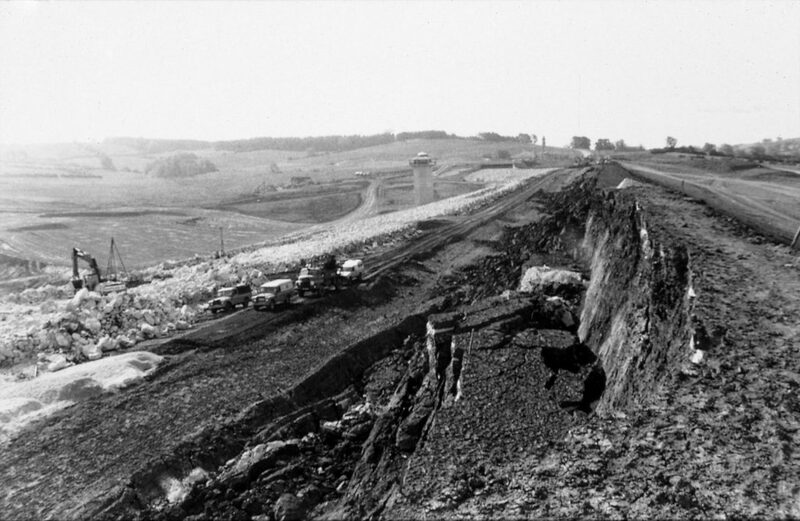 Sulphate attack on concrete was discovered when investigating the partial collapse of Carsington Dam in 1984. In this case, pyritic mudstone had been used to form the outer shoulders of the dam and, in order to prevent standing water, limestone drainage layers were added into that mudstone. Unfortunately these drainage layers allowed for increased movement of water through the material, which meant that the acidic groundwater had easy access to buried concrete structures that subsequently suffered sulphate attack. Other problems linked to the pyrite at this site included blockage of drains due to precipitation of minerals, such as gypsum, and acid water runoff that required treatment before it could enter the local water system. However, sulphate attack on concrete is only rarely seen in the Irish pyrite cases. Indeed, there was only one case that I looked at as part of my research where sulphate attack was confirmed to have occurred. 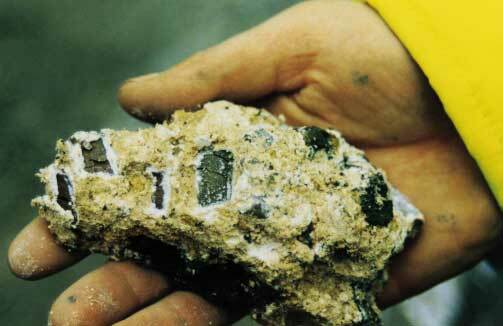 In that case both ettringite and thaumasite were found in the upper few millimetres of the concrete ground beams. However, in the cases that were the focus of the research, there were no confirmed cases of sulphate attack on concrete. The problem with these properties instead leads back to the mention above about the mudstone material being organic-rich. The majority of the organic matter in the mudstone comes from decomposed micro-organisms that are primarily made of calcium carbonate (CaCO3). Calcium carbonate reacts in the presence of acids to release carbon dioxide gas and calcium ions into solution. The calcium ions in turn react with the sulphate from the acid to form gypsum (CaSO4.2H2O). The pyrite crystals found in the mudstone are generally on the scale of tens of microns in size. By contrast, the gypsum crystals can be around 100 times larger at a few millimetres in size. This means that the very process of replacing the pyrite with gypsum causes expansion of the material. This expansion is increased by the way in which the gypsum preferentially precipitates along layers in the mudstone. This forces open these pre-existing lines, making the material expand and also allowing better access for air and moisture through the material, which furthers the reaction process. As the mudstone is confined by the floor slab and the foundation walls, the expansion eventually reaches a point at which it exerts pressure on the underside of the floor slab and inside of the foundations. This in turn leads to upwards movement of the slab and, in some instances, outward movement of the foundation walls themselves. 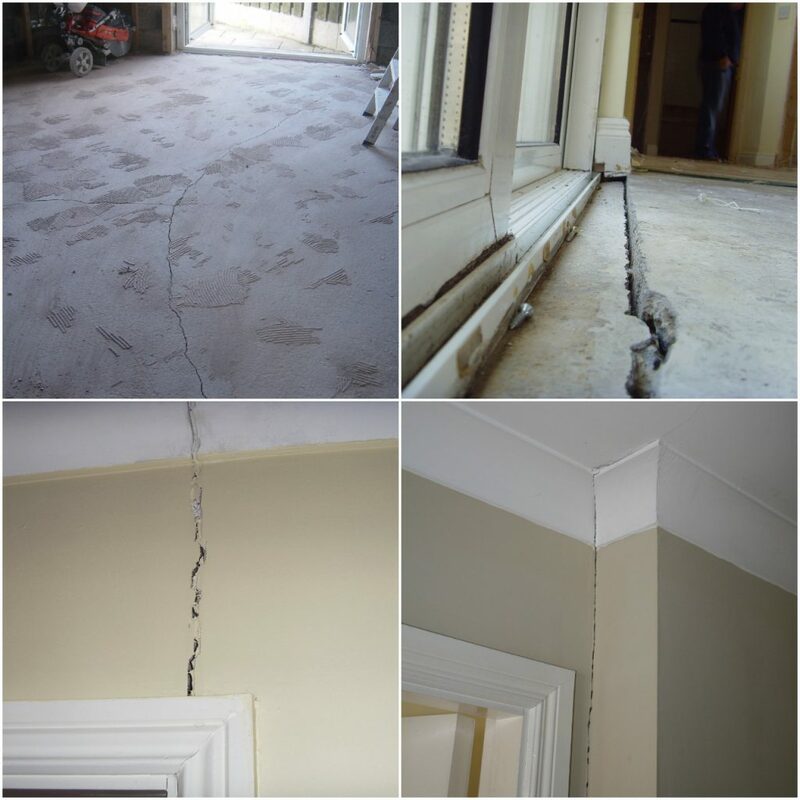 The movement of the floor slab causes damage to the slab itself, as well as causing movement of and damage to structures sat on the floor slab. This includes movement of internal partition walls, and causes secondary effects such as doors not opening properly due to the uneven floor. The amount of uplift often changes in amount across the floor slab in any given room, with humps often occurring towards the centre or one side of a given open space. Likewise, stellate cracking of the slab is common, although not always visible below fixed floor coverings such as tiles, although they may themselves show signs of cracking. Shearing features are common where walls meet, especially where an internal stud partition (that has moved) meets an external wall (that has not moved). 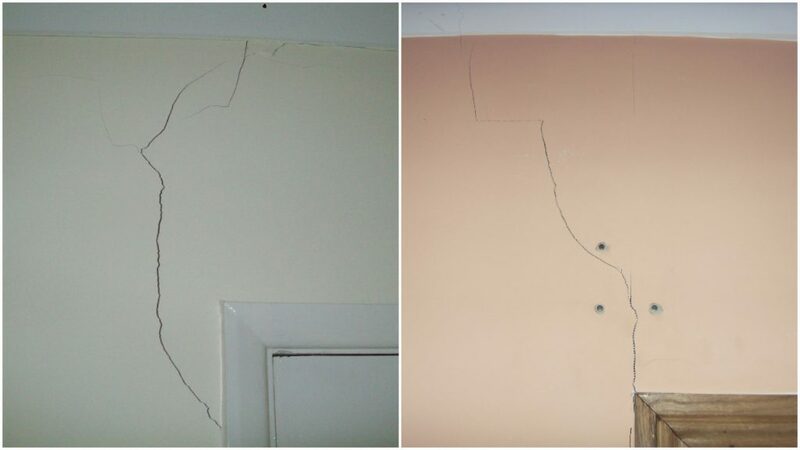 Cracks are also common around doors and in ceilings, occurring first along plasterboard seams and also at angles connecting seams with other features. Much of this might sound familiar to an experienced engineer, several of the “features” of pyritic expansion are similar to those seen when settlement occurs at a property. Indeed, in several of the early pyrite cases the damage was assumed to be caused by foundation settlement and treated accordingly. It was only when damage reoccurred after repairs that other options were investigated. Cases of pyritic heave damage in the UK are rare, however, they are not completely unheard of. There were a series of domestic properties in the Teesside area found to be affected in the 1970’s and a couple of isolated cases in Glamorgan in the 1980’s. The two cases in Glamorgan were related to pyritic bedrock rather than fill and so can be considered a little differently. Still, materials containing pyrite can be common in the UK, from red ash colliery spoil which was used as fill, to mudrocks and shales formed as part of the Coal Measures. Tests for sulphates can be carried out by most testing laboratories and samples can be obtained from simple trial pit or borehole methods. I know everyone expects the geotechnical engineer to say this, but proper site investigation is important; even a desk study looking at the geology and history of an area can highlight potential issues. Any instance where these materials are exposed to air and water could result in the production of acidic groundwater, at which point the possibility of sulphate attack and gypsum production is a viable issue that should be considered in the design process.